Years ago I bought two old albums of family photos at the Tinker Farm estate sale in West Sunbury, Pennsylvania. Under one photo I found the names: "Mrs. Hebblethwaite - Sarah Hebblethwaite." On the back of the photo is: "W B Micklethwaite, Photographic Artist, Westgate, Heckmondwike & Commercial St, Batley." I believe I've found the link between the Hebblethwaites (England) and the Tinkers (Pennsylvania). In 1859, Annie Hebble(th)waite (b. Penistone 1838) married Zechariah Wainwright Tinker (b. Penistone 30.03.1829). Zechariah (Zachariah) Wilkins Tinker, born in Pennsylvania, married his cousin Frances Tinker, daughter of Zachariah Wainwright Tinker and Annie Hebblewaite (Hebblethwaite) Tinker. He is the "Z.W. Tinker" of West Sunbury, PA, whose family had the estate sale where I purchased the albums/post cards. Julia A.H. Hebblethwaite, 11-year-old daughter (student). 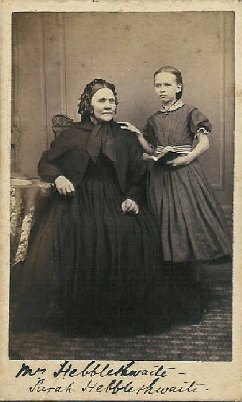 I surmise that the "Mrs. Hebblethwaite and Sarah Hebblethwaite" shown in the picture album are the widow Sarah and Sarah E. Since the photo is undated, it's hard know know for certain. Can anyone help solve this photographic mystery? I'm doing a One Name Study of Micklethwaites and came across your photo taken by W B Micklethwaite. He was born in Ripponden West Riding of Yorkshire, married in Ashton Lancashire in 1840 and was still there in 1861. He was in Heckmondwike in 1871, but remarried in Rochdale in 1874. By 1881 I believe him to be in Ireland. So your photo is dated 1871 +/- 10 years. WB was the father of FW Micklethwaite, famous (in Canada) for his scenes of early Canadian life.